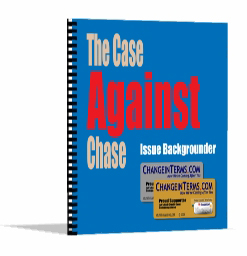 The purpose of the publication is to allow individuals who are new to the issue that arose when Chase Card Services decided that it did not want to honor a promotional offer as was indicated by a change in terms notice that it disseminated to customers late last year (i.e., beginning around November-December of 2008), to quickly get-up-to-speed and grasp the situation. Posted in: "Bail Out", Class Action, Credit Cards Coverage in the Media, Dirty Tricks and Traps, Entrepreneurship, Join the Fight. I am yet another roadkill of Chase bank. I had a VISA card with Chase with a zero balance. I bought a new car 2 1/2 years ago. I was shopping around for a car loan, which I would have had NO problems getting…when I happened to talk to a customer service rep from Chase. She talked me into using the credit card to finance the car as they were offering a low, fixed, 4.99% interest rate for the life of the loan, as long as you were not late with your payments. I was VERY leary about doing this, but I was assured that the terms of my loan would not change as long as I was not late. per month. Fortunately I have the loan at least 1/2 paid off. My minimum payments had been 2% of the outstanding balance, which at this time is about $241 per mo. I always continue to pay the $400 per month. no opt out and the new terms are non-negotiable. If I don’t make the minimum payments they will raise my interest rate to some usurious rate. I am able to make the increase payments if I absolutely have to, but I had not budgeted for this, and I am FURIOUS about it. I’ve read of many people caught in the same scam who are unable to make the increased payments. I’m just relieved that they didn’t pull this scam shortly after I’d bought the car, otherwise my payments would be close to $1000 per month, which would be difficult if not impossible for me to make. I have sought out any option for taking this loan away from Chase, as I would LOVE to close this account. The options are not good. I would qualify for a car loan, which has good rate, except that I own the title of the car. Because of this they will not give me a car loan. as appliances, (which I have purchased before with 12 mos no interest same as cash terms). I’m too afraid they may call their loans and demand ridiculous payments I couldn’t afford to make! I am not an attorney, but it is my sincere hope that someone will read these comments and file a class action suit against Chase bank. I have closed my other Chase VISA card, and I will NEVER do business with them again for anything!!!!!!! I hope they go out of business. Funny, the new Sapphire Visa card is marketed to people with incomes of $120K or higher. I just about qualify…. but guess what….they can go fish!!!!!! I was offered a 3.99 fixed for life. This was better than our bank rate so I used it to build a two car garage. Payments were around $450.00 at first ,since paying down my payments decreased to $380.00. I NEVER missed a payment . This month I was shocked when my min. payment was over $1000.00 . I called and they assured me it was increased to help me and that my 3.99 fixed rate would stay the same as long as I paid this outrageous increase. I went to a lawyer and he wants chase to send him copies of our terms and agreements , he said since you’ve never missed a payment they can’t do this, our hands are tied as lawyer said if we pay this we may be agreeing to new terms. If we don’t we will be in default . WHAT TO DO . Be better off to join all the others that were forced to do this. I accepted a balance transfer offer at 3.99% for the life of the loan. I have been paying on this account each month on time and always more than the minimum. Last month I sent $150 though minimum was $111. To my astonishment my new statement requires me to pay a minimun of $272 with no prior warning. This will wreck havoc with my budget. I have no choice. If I don’t pay it, they will hit me with a default rate. How can this be allowed to happen? I too was notified of the onerous increase in the minimum payment by Chase. For them to say it is ONLY to the folks with large outstanding balances over a long period of time is an outrage. I have had a Chase account for 10 plus years and had a small balance or none for most if this time. Six months ago, I accepted an offer for a balance transfer of 3.9% plus a 3% one time fee that was for the life of the loan. I utilized this to pay off another loan to reduce monthly expenses. Imagine my shock now that the payment went form $180 per month to $450 per month as of Sept. This will not break my budget, but will put a severe crimp in it. If knowing their plan’s a head of time, I would have made this transfer. looks like all they wanted was the 3% transfer fee for short term profit and hope folks could not pay the increase minimum payment so they could go to the default rate of near 30% instead of the 3.9%. I will pay off this Chase account and close it after applying for a new card after checking with bankrate.com. Dr. Robert Lahm, Good Easter Morning to you. Thank you for your leadership, I have found your website to be among the very best. My travail with Chase began in November, 2008 when I received a letter from Chase Business Banking out Houston, Texas, signed by a certain Peter Nardo, Senior Vice-President ( PDF of letter available upon request ). Chase invoked the acceleration clause of my business loan contract with Bank One, circa 1999, and revoked my line of credit for no apparent reason. No missed payments, no late payments, paydown every month. I sent a certified response letter to Mr. Nardo, requesting the original loan documents, a certified copy of the merger agreement with Bank One, and the Federal document that approved the merger; that until such time that Chase proved it’s legal standing to me, I did not recognize the claim. Moreover, I stated that until such time that Chase proved their legal standing to me, I would suspend payment on that loan, and two other Chase credit card accounts. ( PDF of response letter available on request ). The total debt being approximately $30K, 25K on the business loan, and 5K on the credit cards. Since then, they have been calling 7,8, 10 times per day, caller ID says ” out-of-area”, private party, things like that. Recently, they have been using their 800 number(s) that does ID them as Chase. I have not responded to any of their calls, preferring to have any correspondence in a time-stamped, written format. They even sent some disinterested third party up to my mountain property to deliver a letter. That party informed me that she was to take pictures of my house and vehicle, ask questions, get whatever information available as to my assets, etc. Once that started, I told her to get the hell off my property and never come back again. My original loan papers state that three documents are to be read as one instrument. The signed and dated Agreement, the Confirmed Loan Terms, and the Cover Letter stating the terms of contract, Prime plus 3 per cent, etc. The problem with that Cover letter is that it was back dated to a day before the signed loan agreement, therefore depriving me of Rescission rights, a reasonable amount of time to research and receive documents referred to in the contract such as the Uniform Commercial Code, the American Arbitration Association, Colorado Revised Statutes, etc. I believe this may have been a pattern of fraudulent policy in the 10 or States that Bank One did business in. Once Chase files on me, my intention is to request an investigation of these potentially fraudulent activities for each of the State Attorneys General cited, and whatever federal entities will hear my complaint. I will also demand a forensic audit of my account covering approximately 10 years. My credit is ruined, which is a good thing, I’m out of that paradigm, and am facing liquidation, a first position lien on my house, garnishment here in Colorado, very serious stuff, enough to ruin my life. This is a very simplified synopsis of a complex legal situation, not the least of which is a corporate protective veil that induces confusion and ambiguity to the totality of the result. I am going pro se, because there is no money for competent legal defense, and I trust no one these days. The purpose of this memorandum is to make contact with you, get my story out there, and network to the highest degree possible, and that I am willing, ready and able to join this effort to hold predatory banks and companies accountable. Thank you again for the information on this website, it is extremely valuable to a pro se litigant in my position. I think my earlier posts are now deeper into the site archives, but I did have some remarks to the effect that is was astounding to me that Gordon Smith was lecturing on leadership at the Thunderbird school while his helpers back at Chase headquarters were dropping this bomb on customers. Thanks for your comment (I agree, completely). Maybe it takes a CEO who earns less than 27 million a year to understand the economic situation, the plight of the consumer, and the concepts of loyalty, truth and honor.